The United States’ economy is a few months short of beating its longest expansion ever, which took place from March 1991 to March 2001. As we approach this milestone, there are increasing concerns about the possibility of a recession in the coming years. Do economic expansions die of old age? Empirical evidence suggests that there is no clear correlation between the length of an expansion and the probability of a recession. There is an alternative way of thinking about the age of an expansion, in terms of how much economic slack there is left. Expansions are periods when the economy returns to full employment. As unemployment becomes low and reaches levels around or below its natural rate, is it possible to maintain this state for a number of years? Or does “full employment” automatically lead to imbalances that represent the seeds of the next crisis? In the case of the U.S., history suggests that “full employment” is not a sustainable state and that once we reach such a level a sudden increase in unemployment is very likely. In Figure 1, I plot unemployment rates around the peak of each of the last five cycles (where 0 represents the month the recession started). This shows five years before each recession started and 10 months after the recession. All cycles display a V-shape evolution for unemployment. Unemployment reaches its lowest point around 12 months before the recession and, in most cases, unemployment is already increasing in the months preceding the recession. What is interesting is the absence of a single episode of stable low unemployment (or full employment). It seems as if reaching a low level of unemployment always leads to dynamics that soon generate a recession. 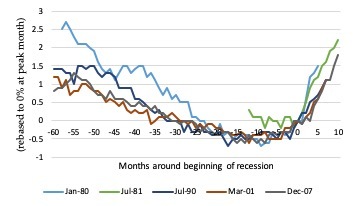 Recessions die of old age when measured in terms of how much economic slack is left. If this pattern was to be repeated, today the U.S. must be very close to an inflection point – a recession. Of course we might observe a different pattern this time but it would have to be a pattern that is not consistent with historical evidence. This result might sound obvious and mechanical: Once the unemployment rate is low, there is only one way for unemployment to go – up. This is true but what matters is whether a persistent period of low and stable unemployment is possible. In the case of the U.S., the answer is no. One way to visualise this possibility is to look at other countries. A good example is Australia which has sustained a low unemployment rate for decades. 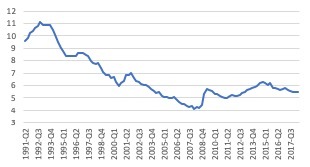 After an Australian recession in the early 1990s, unemployment increased and then started a decline through a path similar to any U.S. expansions. By 2000, unemployment reached a low level which has remained mostly flat for years. In other words, the unemployment rate does not display a V-shape dynamic but looks more like an open L-shape. We can quantify this by relating the result to academic literature that analyses the determinants of the tail-risk of unemployment (or GDP) changes. By tail risk we mean large increases in unemployment, which tend to be associated to economic recessions. The literature, including Cecchetti (2008), Kiley (2018) Adrian, Boyarchenko, and Giannone (forthcoming), looks at the determinants of worst potential outcomes over a specific time window. In my research paper, “Is Full Employment Sustainable?”, I use quantile regressions to understand how the low level of unemployment is associated with recessions. In the case of the U.S., the evidence is very strong. Yes, low unemployment is typically followed by an increase in unemployment (as there is reversion to the mean). But the interesting part is that the size of the coefficient increase as we move from small changes in unemployment to large changes. In other words, we do not often observe small increases in unemployment, the most likely scenario is that of a large increase, a recession. Interestingly, the same phenomenon is not present in other countries (such as in the example above, Australia). Why is full employment unsustainable? The pattern of U.S. unemployment and recessions suggests that low levels of unemployment are a strong predictor of sudden increases in unemployment, associated with crises. We do not observe in the data any sustained periods of low unemployment. But why is low unemployment unsustainable there? What leads to a recession? The academic literature tends to emphasise two sets of variables, associated with either macroeconomic imbalances (such as inflation) or financial imbalances. Interestingly, the introduction of these variables in the quantile regressions above makes the effect go away. In particular, once we control for credit growth, low unemployment is no longer a good predictor of the tail risk associated to recessions. This result suggests that recessions follow periods of low unemployment because imbalances are built during those years. What is interesting is that the evidence shows that, so far, this has always been the case, that the U.S. economy has never managed to sustain a low rate of unemployment without generating the imbalances that lead to a recession. For the current U.S. economic expansion to last much longer, this cycle would have to be different from all recent ones. Is The World Ready For the Next Recession?